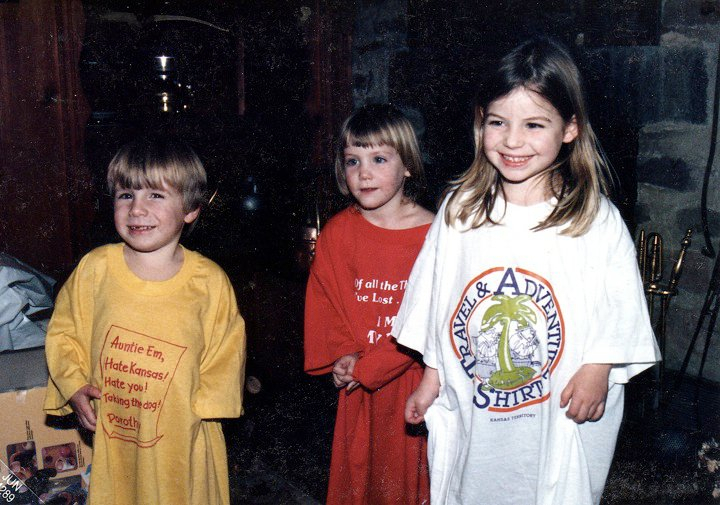 (In this photo: James – my brother, Katie – my cousin, and me). My entire life, I have lived life in a glorified, imaginative way. I can’t remember exactly when it started, I think I was five, when I began creating an alternate universe. My mother, brother and I would dress in costume; assume different mannerisms, attitudes and names at a tea party every day. We would make tea, fresh bread and talk in character and wear costumes all afternoon long. I had the greatest mom in the world. This creativity opened a new outlet for me. By the time I was ten, I felt more at home on stage, in a dance class, or in choir rehearsal than I did anywhere else. I felt alive when on stage, or singing in a choir. I remember singing the Faure Requiem in Fifth grade, while the rest of the choir was made up of high school student or adults (my wonderful father included) in Philadelphia. Since that experience, very few things in my creative life have wavered. Don’t be fooled, I have gone through more life lessons and experiences than most people my age – including marriage, divorce, sexual abuse, a suicide attempt, hospitalizations, and a rebirth in NYC. Plus the expected failures most actors experience everyday. Its a hard life. However, I am excited where the next big adventure takes me. I have experienced extreme highs where I feel as though I am flying, and lows so extreme I would rather be dead. Steadfast and strong, I believe these experiences will someday make me an actor that no one dare reckon with. Therefore, I write this blog in honor of the future artists out there, that have so much living to do. I have learned that scripts can only teach us so much. Our own humanity, imperfections, and scars make us unique and worth remembering. There is no shame in being human, only shame in being boring. Take life by the balls, apologize to nobody for being yourself, and live with no regrets. ~ by Elizabeth on July 22, 2011.